In 1989 I taught myself to be a journalist (I had no idea you could study it in university). By the end of that year I was covering the Romanian revolution for Scotland on Sunday, a newspaper that was too “Scottish” to send me over to witness the action on the ground. I didn’t get here until January 1990, which I thought was far too late, but there was still plenty of drama on the streets of Bucharest. On the 28th of January 1990 I saw massive crowds on the streets protesting at Iliescu’s decision to allow the “front” (Frontul Salvarii Nationale) to stand in the forthcoming general election. The front was the ad-hoc political formation that had seized power on the 22nd of December 1989, straight after the fall of Ceausescu and the Romanian Communist Party. The front had taken over in a manner that was too smooth for many Romanians, who realised that they were now being led by former Communists who now called themselves democrats. But surely that was better than having the sort of post-revolutionary chaos that we’re now seeing in Libya and is typical after a revolution? As a journalist wandering the streets of Bucharest in early 1990 — trying to work out what the hell was going on and what to report back to Scotland — it was exciting, confusing and bloody cold. I got myself a furry Russian hat to keep warm and hung out with the foreign journalists, all of whom seemed to be more experienced and better informed than me. Even though I didn’t have a valid press card (I had no contract with Scotland on Sunday and would only get paid — peanuts — if they published an article) I was allowed into government press conference on the basis that I was a pushy foreigner with a notebook. These conferences were a good opportunity to get warm. The other foreign journalists had attractive and intelligent translators who would explain the intricacies of Romanian politics — I had Laurentiu Calciu who didn’t like to speak much. I remember hassling him in a government press conference to tell me what Petre Roman was saying; he kept delaying and after what seemed like an eternity he turned to me and whispered “he said nothing!” At that point I knew I had to learn Romanian. Although he was an unwilling translator, Laurentiu is a brilliant cameraman and he had just got hold of a video camera. During the first few months of 1990 I would hang around with him while he filmed people talking. I had no idea what anyone was saying but I did know that Romanians hadn’t been allowed to speak for 40 years and that something extraordinary was happening — a population was learning to express itself. Twenty one years later this material made its way into a film we produced about what was happening in early 1990: After the Revolution. Government press conferences tend to be boring affairs: wooden spokespersons deliver prepared statements, don’t tolerate discussion and are experienced at avoiding tough questions. 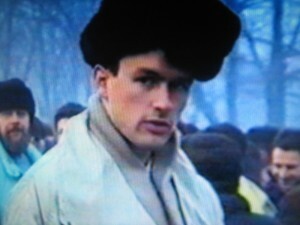 But in early 1990 the government press conferences in Bucharest were warm, open and fascinating. There was a sense of free discussion between journalists and the head of state that is hard to imagine nowadays. The press conference that is presented here took place on the 8th of April 1990. I was there with Laurentiu Calciu and he filmed the whole event. We believe it is the only surviving record of that event and it gives a unique opportunity to see how Iliescu and Roman communicated soon after they had taken control of Romania. Their style of communication is particularly interesting — they were relaxed and none of the usual PR guidelines were in force, there seemed to be no restrictions about what they should and shouldn’t say (Iliescu, for example, promised Chris Stephen from the Guardian that there would be a complete investigation into the Securitate). The atmosphere was more cocktail party than confrontational press conference. What strikes me now as extraordinary about this press conference is that the prime minister was translating for the president. And the dialogue took place in Romanian, English and French and there didn’t seem to be any translation going on (I know that none of the foreigners knew any Romanian). But in 1990 there were so many extraordinary things going on that this didn’t seem unusual. We knew that Petre Roman spoke fluent English, French and Spanish and he seemed happy to be showing off his linguistic skills. I can imagine him trying to impress Iliescu by offering to translate. The whole situation was so new to us — a new democracy, a new government, new procedures — that we didn’t have any frame of reference. How should the new Romanian government behave with the press? But the situation was also new to the Romanian government, an institution that probably hadn’t organised a “free” press conference since the 1940s. What connects me to Romania is the sense that since 1990 all of us have had to learn to navigate in the unfamiliar waters of a new regime, where the old rules have become obsolete and new procedures are necessary. Soon after this date press conferences got tightened up, better organised, tightly controlled by communication experts — and more boring. Here is an example of a genuinely open meeting between a new regime and the international press, and it’s striking how polite everyone is considering that the streets were full of furious protesters. Iliescu was probably at “the top of his game” at this point in his career. He was already head of the front and head of state and a few months later he won a landslide victory as President in a (disputed) general election. In the film you can see a tremendous sense of self satisfaction on his face — he answered questions with real confidence and seemed much more sure of himself that Petre Roman — and he smiles so much that it’s as if he’s treating the whole thing as a joke. He also admits that the front has got almost a million members, a staggering number considering the chaos of the times, and to me that was an admission that the front simply inherited the infrastructure and people of the Romanian Communist Party. This gave him the capacity to get support in every town, factory and village. Nobody at this press conference challenged him about this. Who else was in the room at that press conference? At the end of the video there is a severe looking man in a brown jacket who moves behind the Iliescu and Roman; that was Adrian Sirbu who was the government’s press secretary at the time, the man who organised the press conference and the man who went on to build up the Media Pro Empire. Another face that is interesting to see now is Mihaela Radulescu who is standing by the entrance, wearing the simple and unfashionable clothes of the day, and was warmly greeted by Roman on his way out of the conference. I remember following Petre Roman down the corridor after the event in an attempt to get a few words from him, an exclusive statement for my newspaper. I don’t remember what it was I asked him but I do remember the way that he dismissed me; he didn’t even slow down or look at me as we hurried down the corridor together and he waved me aside with a sense of arrogance that was not at all visible in the conference — where he was eager to impress Iliescu. That impression of Petre Roman has stayed with me ever since. Below, you can watch a one minute preview of the April 1990 conference. Or head over to Vimeo to watch the entire thing (60 minute). Rupert Wolfe Murray is the producer of the documentary film After the Revolution.